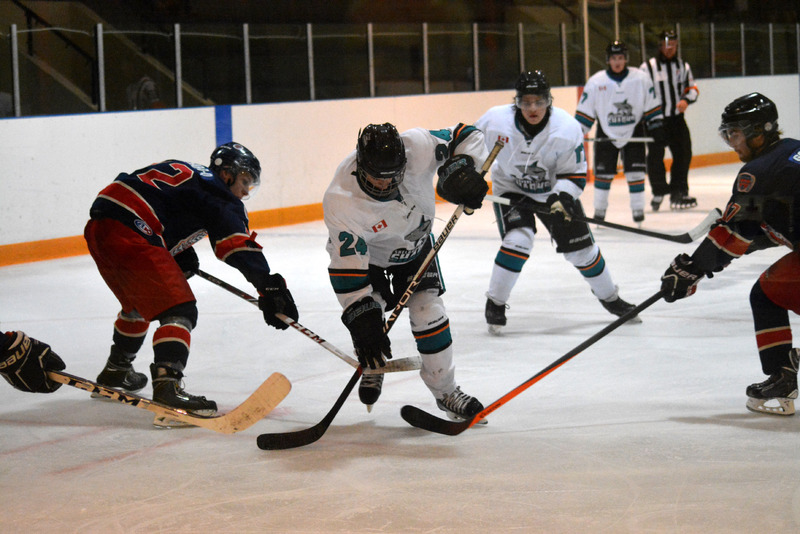 The Shelburne Sharks came up short Monday night when the visiting Grey Highlands Bravehearts got the edge in the first period and managed to stay in the lead for the rest of the game. The Bravehearts took an early lead in the first period then scored again to take a 2–0 lead at just over four minutes into the game. Shelburne’s Christian Huber opened the scoring for the Sharks midway in the period but a third Grey Highlands goal late in the frame put the pressure on the Sharks to get back in the game. The Bravehearts outscored the Sharks 4–3 in the second period to keep the lead in the game after notching two goals early in the period before the Shelburne team could respond. Huber got his second of the game at 10:48 into the period. Kelsey Katchuik and Justin Pereira scored singles to close the gap but going into the final 20 minutes the Sharks were trailing by three goals. The Sharks battled hard in the third period and were back in the game when Katchuik and Sheldon Papesh scored to make it a 7–6 game with seven minutes left on the clock. The Shelburne’s team hope of tying it up evaporated when the Bravehearts scored two quick ones – just 17 seconds apart to take a three goal lead. Papesh scored his second of the game with less than a minute remaining. The final was 9–7 for Grey Highlands. The Sharks are struggling in the early going of the season. After four games they have claimed one win so far. The Alliston Coyotes are leading the Central Division standings with six points after winning their first three games of the season. The Sharks won’t have a Monday home game this coming week. Instead they will play on Sunday, September 27, when the host the Oshawa RiverKings in Shelburne. Game time is 3 p.m. The Shelburne Sharks host the Grey Highlands Bravehearts at the Centre Dufferin Recreation Complex in Shelburne during Monday (Sept. 21) night’s home game. The Sharks gave up a 9–7 loss to the visitors in their fourth game of the season.